This document will demonstrate Wildfly New Build Process via a example. As the figure, Wildfly Build Process Example use a wildfly liked structure, contain 3 modules. 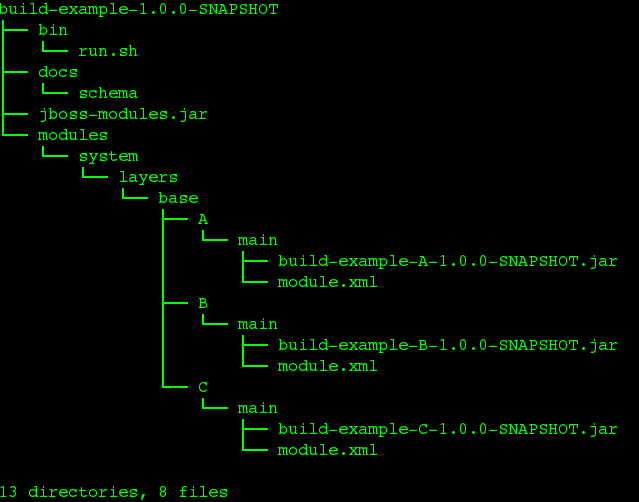 Once build success, you can get feature pack(feature-pack/target/build-example-feature-pack-1.0.0-SNAPSHOT.zip), and dist(dist/target/build-example-1.0.0-SNAPSHOT.zip). but in new build process, you don’t need pay attention to version control and hard copy, maven plugin can do this. Also it’s time saving if you want to build more dist, in previous, you have to unzip more dist to a new folder and zip again, but now you just need config provisioning plugin, like configue dependency, then maven plugin will generate server dist. Eg, if you have teiid-feature-pack and wildfly-feature-pack, confgiure these 2 to provisioning plugin, the plugin will generate you a server dist.